Below there is a picture of Tom in the "Set" position ready for a blocks start. You will notice that the angles at the knees of each of his legs are 120 and 90 degrees (back and front legs). Conventional starting techniques says this is the position that provides the most economical starting position. Generally, this will mean that your front block will be two foot lengths back from the starting line and your back foot three lengths. To place your blocks on the track you need to have the central part of the block put down first, pointing directly in the direction which you are going to run in. This will be straight down the middle of the lane in a 100m race, or may be angled from the outside of the lane towards the inside to help your run in a straight line to start with and then hug the inside of the lane to run the shortest distance. When the gun goes to start the race the aim is to drive out hard from the blocks, with relatively short fast strides to build up speed quickly, without standing up straight. It should take about 20-30m before you are in your full running action and standing upright. This is called the drive phase of the race as you are accelerating to top speed. The aim for the rest of the race will be to maintain your speed. As your hips form your centre of gravity it is useful to think of forcing them forwards and only slightly up as you build up speed. It will also help to drive your arms fast to build up speed, as you legs will automatically follow. 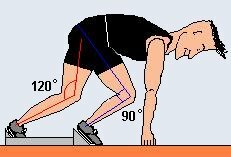 If you are doing a crouch start without blocks try having your feet 1 1/2 and 3 foot lengths respectively back from the start line, with the direction of your running to be the same as if you were running from blocks.